Hugh Todd was born on 23rd February 1864 at Duncrue in Carrickfergus to Hugh Todd and Matilda Smyth. His mother died at Queen Street in Ballymena on 24th April 1882 and his father, a Flax Spinning Master at Braidwater Mill, married Rebecca Gaston at Connor Presbyterian Church on 7th July 1883. Hugh was a marine engineer when he married Agnes Johnston at Fortwilliam Park Presbyterian Church in North Belfast on 14th December 1887 and they were living at Dock Street in 1911, with their eight children ranging in age from five to twenty-one. Before the war, Hugh Todd had worked for Workman Clark and had held the position of Chief Engineer with the Head Line and the Lord Line. Hugh Todd was 51 years old and serving with No 3 Special Service Squadron Royal Naval Reserve when, according to the Ballymena Observer, he “contracted a bad throat and quickly succumbed”, dying on 3rd July 1915 at Inverness Hospital. 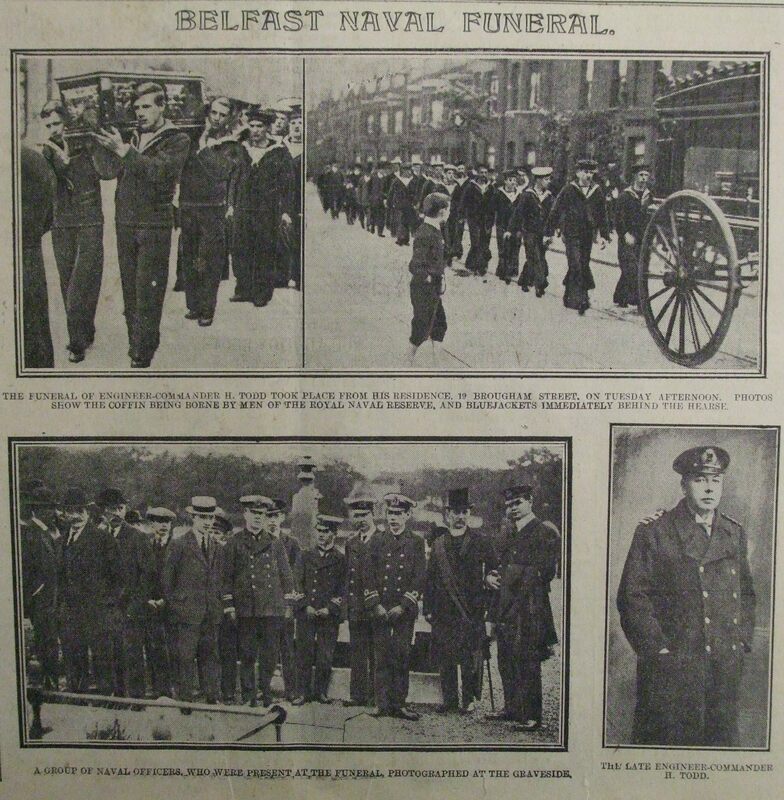 His body was returned home and the funeral cortege left from his home in Brougham Street on a gun carriage accompanied by Royal Navy personnel and representatives from the Blue jackets. A wreath from the brethren of Thomas Valentine Masonic Lodge 21 was laid on the grave, but his name does not appear on the Roll of Honour for Crumlin Road Freemasons’ Hall, on which Lodge 21 is represented. He is commemorated on the Rolls of Honour for Sinclair Seamen’s Presbyterian Church in Belfast and Wellington Street Presbyterian Church in Ballymena, on the Ballymena & District War Memorial and on a family memorial in Ballymena Old Graveyard.